No matter how good self-driving cars become at avoiding roadway hazards, much will remain out of their control. Take Jimmy, for example. See Jimmy run. He’s chasing a ball, and he’s screened completely from view by a parked delivery truck until the moment his sneakers hit the street. See Jimmy fly — but not very far: He’s been hit by a Google self-driving car. 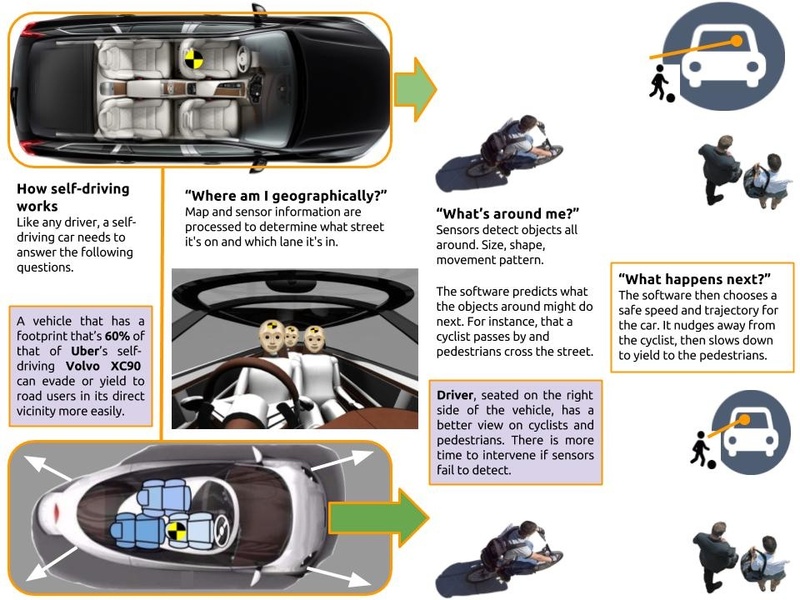 In this manufactured scenario, the vehicle that strikes Jimmy is equipped with an impact-reduction system Google has invented. “The technology relates to reducing the likelihood of injuries or damage to objects such as pedestrians, bicyclists, animals, other vehicles, or simply inanimate objects caused by collisions with vehicles,” said an autonomous-vehicle patent granted Feb. 14 to Google. The company has spun off its robot-car program into its own company, Waymo, which now falls under Google parent firm Alphabet. Google tweaked this idea, adding computerization and sliding panels. “Computing devices within a vehicle may determine that an impact with an object cannot be avoided by way of braking, steering, and/or accelerating the vehicle,” the patent said. “When this is the case, the computing devices may work to adjust the amount of force necessary to break one or more shear pins which are holding a panel of the vehicle in place. The car’s panels would be mounted on sliders. When a collision is imminent, the tapered “shear pins” preventing the panels from moving backward would move into a position where they’re more easily broken, allowing the car’s panels to slide backward in a crash and absorb impact. The system could account to some degree for, say, the difference between Jimmy and his neighbor’s escaped llama or another car, as the pins would need to break under different amounts of force depending on the heft of what’s struck. Whether Waymo intends to use this system in its autonomous vehicles remains unclear: many technologies are patented but never see the light of day. That said, this robot-car technology seems more likely to appear on vehicles than another system Google has patented, in which the car’s hood is coated with glue, covered by a thin hard shell that would break upon impact with a pedestrian, so the hapless biped would stick to the hood rather than getting hurled into a harder object or the roadway. ^^ obligatory Luddite rant inserted above.. There were numerous devices invented to keep streetcars from running over people over 100 years ago.